Features are now organized according to the stages of search: crawling, indexing, and serving. The settings have moved to the gear icon in the top right corner. 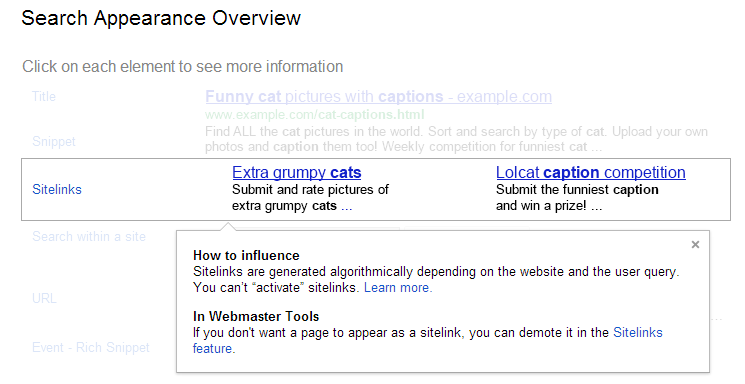 A new menu item has appeared in Google Webmaster Tools to help webmasters understand what influences snippet generation and the appearance of sites in search results. For many SEOs, there is nothing new here, but for smaller businesses unable to afford search consultancy it will provide useful information and drive home the need for clear site architecture and the need to use semantic markup or structured data. 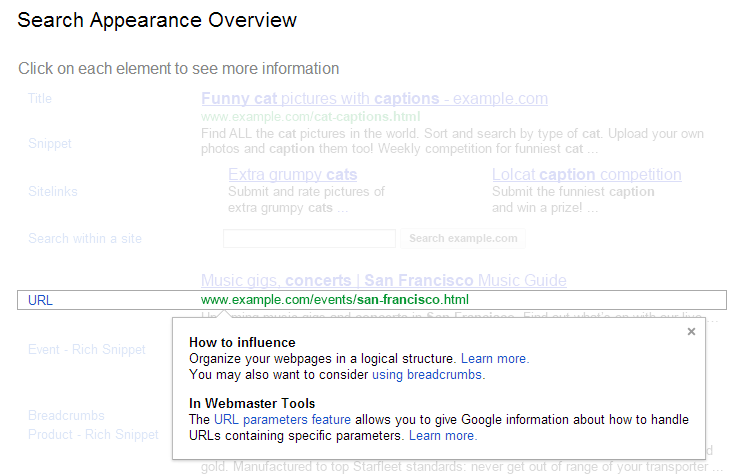 If you hover over the individual elements, then additional information and links to Google guidelines are shown. 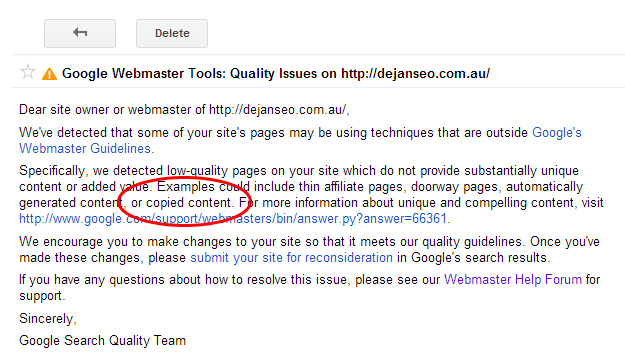 The following screenshot from Google Webmaster Tools shows the help presented for influencing the URL appearing in search results. In this case, the advice is to either have a clear site architecture, or to add breadcrumbs. This additional information is very useful for site owners and provides a good point of reference for many smaller businesses hoping to optimise appearance in search. and issued DejanSEO with a warning message. The red circle highlights the crux of DejanSEO’s hijacking test. Content from the target was copied verbatim to a new domain, then that new domain was given an authority link (in order to give it higher page rank than the source) and thereby displace the original source in SERPs. The really interesting effect of the hijacking was that it also gave visibility (through Webmaster Tools) of the backlinks to the original source page – very handy as an additional source alongside MajesticSEO, ahrefs, Blekko et al. Please comment on this post if you have seen or received a message worded in exactly the same way from the Google Search Quality Team as the one shown above. It’d be interesting to gauge the extent of these messages. Notice that Google is very open about the impact of using hidden text – stating removal from search results for at least 30 days. 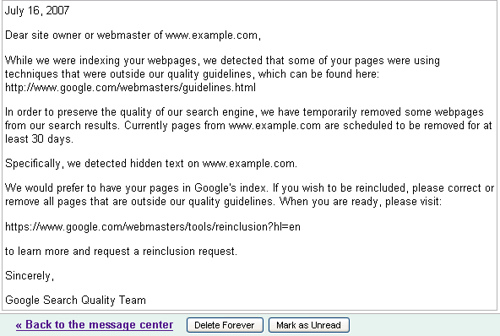 Google is less open now about the penalties applied to sites and pages found in violation of the guidelines. So SEOs must use knowledge and experience. In mid August I noticed huge drops in brand term impressions showing in Webmaster Tools, but hardly any change in brand term click through volumes in Google Analytics. Impressions have dropped by 66% ! The first thought was some sort of penalty for the brands had been applied, perhaps a Panda related change meaning that the brand no longer appeared in search results? However the number of clicks remains unchanged. Furthermore, even though the volume of impressions had dropped by around 66% for brand terms, other organic search terms were completely unaffected. If this was Panda, it was a ‘brand keyword selective’ Panda and that didn’t make any sense at all. From studying other sites, the affect of the Panda update has been seen to help or support known brands with very few exceptions. So any Panda related penalty would have dropped impressions for all keywords, not just brand terms. Digging deeper…the date of this recorded impression drop was 16th / 17th August 2011. This coincides precisely with the date that the enlarged sitelinks were released in the UK. Since 17th August, a brand search gets just ONE slot in SERPs with MANY sitelinks beneath (up to 8 or 12 for dominant brands). The single entry is counted as an impression in GWT, and the individual sitelinks beneath are not included in the impression count. The total number of impressions recorded for a brand term search is therefore much reduced. 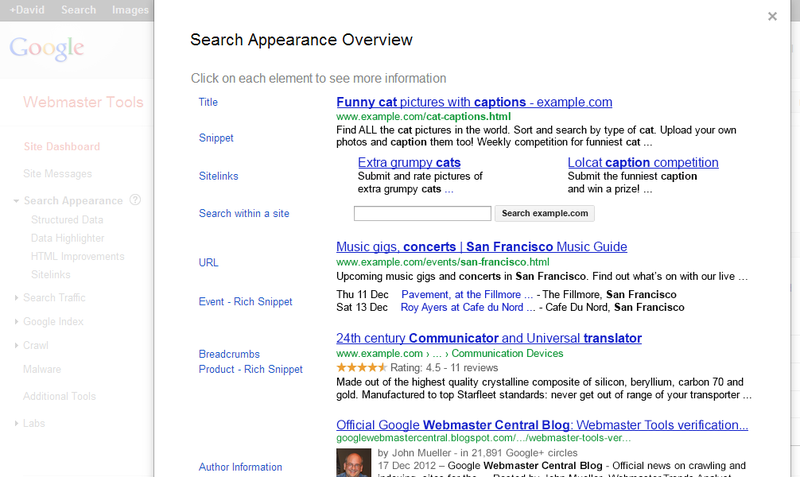 A drop of 50% means that the brand previously had two entries in the SERPs, where now it has just one. A drop of 75% would mean that where the brand previously claimed four entries in SERPs, it now just has one. So for a typical brand search, I’d expect GWT to be reporting drops of 50 – 86% for brand term impressions, but similar levels of click throughs and a higher reported average CTR. Exclude ‘brand’ terms when examining impression data spanning the date of this change in GWT. Brand search usually accounts for a significant % of traffic, so changes to sitelinks will skew your analysis. This is especially true if you are looking for GWT impression uplifts following SEO efforts… don’t let the Google’s modification to brand term impression drop spoil your analysis!